This is one of those dreamy pictures that played with my head at first glance... was it a gold and aquamarine ring perhaps? 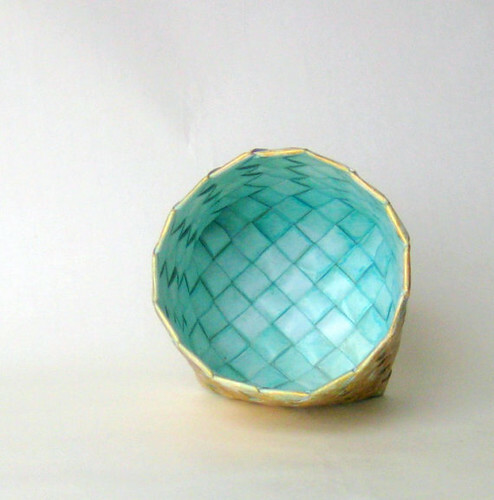 As lovely as that would be, instead it is a woven paper basket created by Birgitte Hendricks of Cambridge, England. A Danish textile and fiber artist, Birgitte works with paper rather than traditional birch bark, and implements an old Scandinavian basket weaving technique. Folding, weaving, painting, and sealing add up to make a surprisingly sturdy container that can be more than a beautiful conversation piece. If you'd like to try your hand at making a basket of your own, Birgitte offers the instructions and long paper strips in her shop, Sew Danish. ooh that is pretty Anne... thanks for the link.. off to take a peek.. have a great weekend..
so pretty. i've seen baskets like that before but didn't know that the technique was danish. Such pretty colours!! reminds me of the boxes made from palm leaves for sweets in our villages. very nice and I absolutely loved the grocery bag Easter basket. Thank you so much for this lovely feature. I really appreciate it! whoa! you're totally right! the picture keeps flipping convex/concave when i look at it for awhile. i love the color combo! I am a bit crazed about baskets this time of year, this one ids great:) Love it!